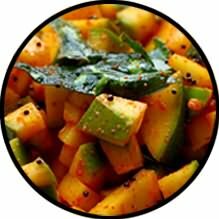 Mango Pickle (Aam Ka Achaar) is made up of a spicy raw mangoes and mixed with homemade pickle masala . Pickled mango is a spicy dish or condiment that can be enjoyed with almost any food. You can spread it on bread, eat it with roti or any kind of parantha, or even enjoy it with rice. There are a variety of ways to make this tasty dish, whether you want it to be sweet or spicy.It is a popular condiment adds the extra “oomph” to every meal. 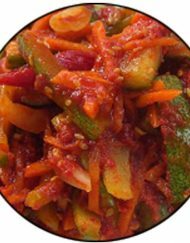 Traditional Indian relishes or “pickles.”… Grab now !! Enjoy your spicy Mango pickle , We parcel it beautifully and gift to your near and dear ones. It is best tasted when consumed within the 60-120 days . If you order this pickle online now , Ratlami Tadka serve this at your door step between 2-5 days. 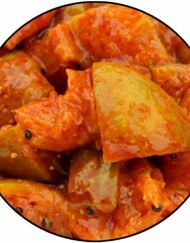 Quickly order this pickle online now and get your own packet of this spicy and traditional pickle “Mango pickle (Aam ka achar)”.